Children who suffer from dental decay have a harder time learning and are less likely to start Kindergarten ready to learn. The Brush program addresses the prevention of dental decay in infants and young children, using a comprehensive approach that involves parents, early childhood education professionals, and children. Brush is an interdisciplinary curriculum addressing dental need. The year-long oral health curriculum and support materials help your classroom talk about dental health while learning literacy, science, mathematics and creative arts. Aligned with HighScope Indicators and Head Start Domains, this curriculum meets the standards early learning sites are tasked with teaching. An important component of Brush is parent education. Parents are the drivers in whether their children brush their teeth, if they visit the dentist, and if they eat healthy foods. 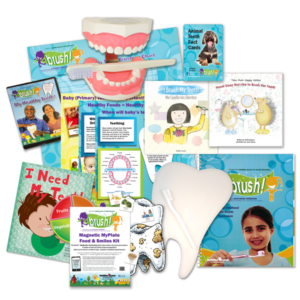 Brush parent materials give easy to understand information on dental care, nutrition, the importance of family meals, and the importance of reading to their children.